Photograph: Courtesy of the Chicago Department of Cultural Affairs and Special Events Claire Ashley, installation view of "frizzflopsqueezepop" at the Chicago Cultural Center, 2013. 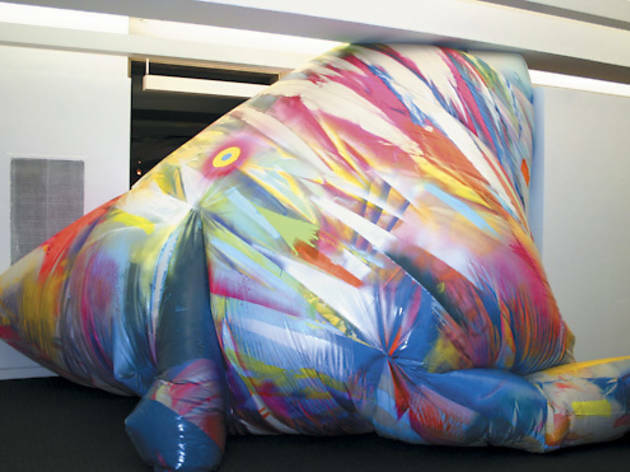 Though they aren’t meant to be touched in the gallery, Claire Ashley’s inflatable sculptures—or are they paintings?—beg to be poked and prodded. It seems as though the Chicago Cultural Center’s first-floor galleries can hardly contain the artist’s recent works, which sprawl across the floor and strain against the walls and ceiling. Ashley’s artistic practice has unexpected influences, according to the exhibition statement by critic Danny Orendorff: The Scottish-born artist became interested in inflatables as a parent concerned about the safety of bouncy castles and plastic toys. Ashley’s streaks and spatters of Day-Glo spray paint refer to the graffiti that she sees on her commute from Oak Park to SAIC, where she teaches. The artist leaves imperfections such as patches and scrapes exposed, making it seem as though her sculptures have been around the block, literally. Despite their joyful colors and goofy titles, and the playful connotations of their medium, Ashley’s inflatables have an undertone of menace. Their sagging, bulbous forms recall bodily organs swollen to grotesque sizes. All are abstract, but several large-scale pieces, including beauwoahzeau (two) (2012), which looks like a fat elephant sitting on its hindquarters, resemble living creatures closely enough to strike one as uncanny. 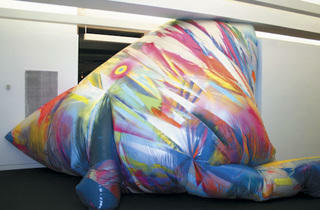 Such colossal inflatables—the biggest, RUD, is 12' tall, 18' long and 20' wide—are the most evocative works on display. The show also includes a few abstract paintings on sheets of Sintra (a rigid PVC), which appear to be studies. (Ashley paints the hand-sewn, plasticized tarps that make up her sculptures before she inflates them, which adds an element of chance to their production.) Small inflatables wrapped around wooden poles come off as intriguing experiments, but only the big ones create the spectacle that makes this show pop.